April 07, 2018 from 4-7pm. Come by for wine and nibbles and to meet her and play with us. Feel free to bring some of your own pieces that you love. Summer Sale. It's that time of year again. We are cleaning up the studio and offering our clients up to 40% off select jewelry items for the month of August. 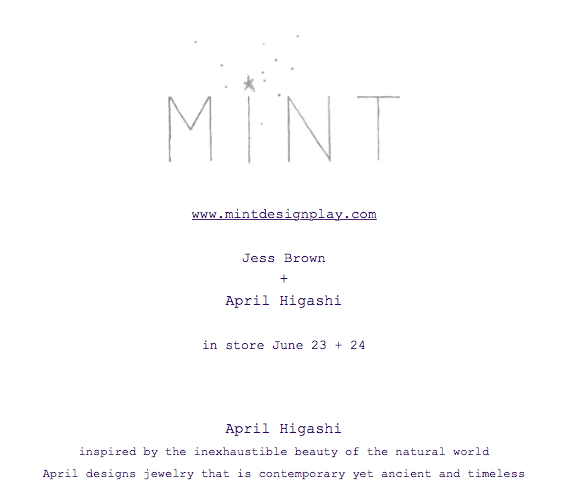 Most items are April Higashi Jewelry, however there are a few other artist's pieces that are included. Come early to get the best selection! 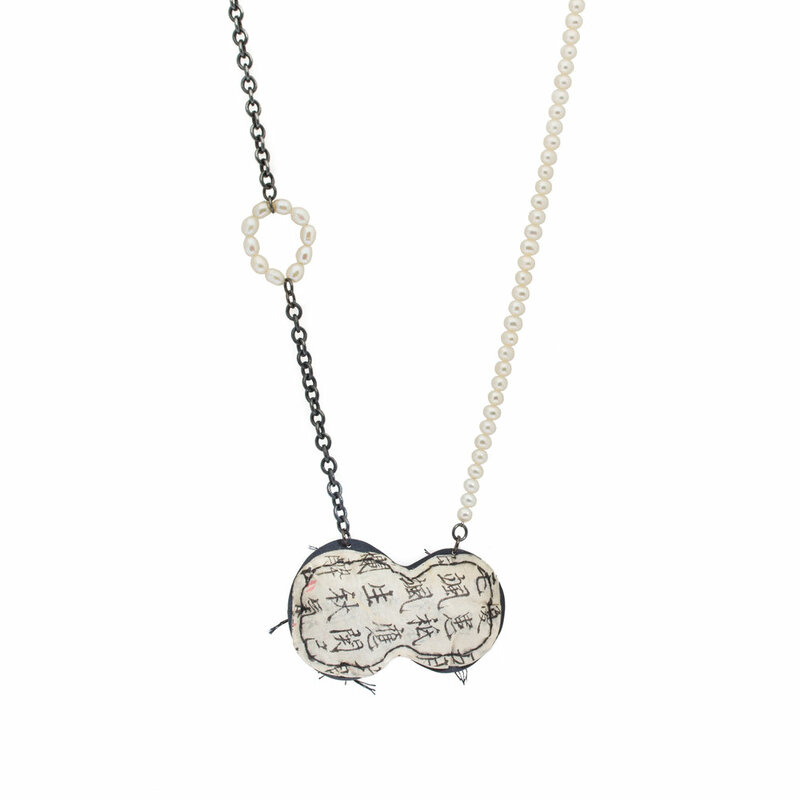 April Higashi; Kōraru Pendant, bronze, silver, diamonds, Jenifer Kent: Duration Series, ink on paper. Shibumi Gallery is pleased to announce Contemporary Enamel running from August 6 – September 25, 2016. An opening and artist’s reception will be held on September 10, 2016 from 5 – 8pm. Enamel has been a prominent technique in fine jewelry making for centuries, and remains an important medium for artists to engage with color, form and texture. Through the work of both established enamelists and upcoming artists, this collection of over 50 pieces demonstrates the diversity and range of enameling as practiced today. This show highlights many of these artists whose work represents a wide range of styles and materials referencing this old tradition and technique. Contemporary Enamel is co-curated by Elizabeth Shypertt and April Higashi. Higashi first made her name in jewelry with her distinctive enamel work. Her early painted matte pieces immediately set Higashi apart in the jewelry world. Along with Elizabeth Shypertt, former owner of Velvet da Vinci, they have had the opportunity to discover and meet many new and exciting artists working in enamel. Participating artists include: Brooke Battles, Jamie Bennett, Jessica Calderwood, Kat Cole, Linda Darty, Helen Elliott, Karen Gilbert, April Higashi, John Iversen, Maya Kini, Deb Lozier, Sarah Perkins, Cheryl Rydmark, Marissa Saneholtz, Rachel Shimpock and Marlene True. All of the artists are based in United States and have exhibited both nationally and internationally. one-on-one consultation for custom work with April Higashi. Inner Worlds references the often over-looked relationship between the human senses and our visual stimuli. It is a rapport that can elicit feelings of beauty, peace, strength or inner tranquility and can be brought on by something as small as a reticulated stone, as immense as the night sky or by a chance encounter with a stranger who makes you take notice that the world is bigger than yourself. This body of work contains portals to my visual interpretation of nature’s random and subtle beauty. I hope these pieces might evoke a personal story or relationship we have with the environment and the world around us.